Some say you’re only as old as you feel. Shmups Skill Test says you’re only as old as you shoot! 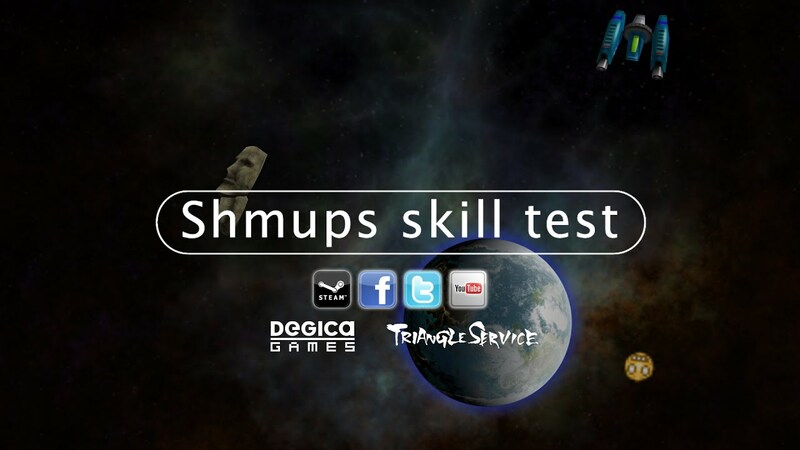 Shmups Skill Test is a clever way to evaluate your shmup skills in the form of a "gamer age". Challenge and unlock shoot-’em-up-based minigames in a gauntlet of shmup nostalgia goodness. When it’s over, you’ll be given a score and gamer age. The younger your gamer age, the better! Bring up to three friends along for the ride and feel young (or old) again together. Are you ready to know your gamer age? Crafted so that anyone can pick it up and enjoy it, Shmups Skill Test features Triangle Service CEO Toshiaki Fujino's nihilistic and surreal humour and parodies guaranteed to put a smile on the face of any fan of the shmup genre. The Steam version is based on the Shmups Skill Test included in the arcade game Shooting Love 2007. The arcade version is a long running hit, still to be found in arcades across Japan, despite many of its peers from the same time (2007) having been long removed. Its arcade sequel, included in Game Center Love. ~Plus Pengo!~, is also still going strong. Furthermore, despite having been developed as an “examination” or “training” game, the versus play proved exciting enough to create the demand for competitions being held, something of a rarity for a shooting game. The Steam version takes this one step further, adding new tests (games) and the ability to play with up to 4 players. You can also focus on practice with the newly added ability to choose specific tests. Of course, no shooting game would be complete without music. “Mr. Shooting Love Sound”, NAOTO returns but he's not alone. With him, we have two guests in the form of Go Sato (of Raiden series fame) and WASi303 (from the Psyvariar series).